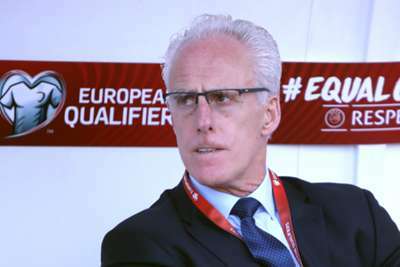 Mick McCarthy accepted it was a "horrible" game as his Republic of Ireland downed Gibraltar 1-0 in Euro 2020 qualifying but insisted he was satisfied with the result. Jeff Hendrick scored the only goal in difficult conditions at Victoria Stadium on Saturday to get McCarthy's second spell in charge off to a winning start. And McCarthy accepted his side's performance was far from pretty but maintained the three points were the most important thing ahead of Tuesday's home tie against Georgia. "It was a horrible game," McCarthy told reporters. "I'll take the same if we get another 1-0 win! "I was asked the other day about momentum. Well the only way of getting that is by winning and that is exactly what we have done. "I’m happy to take 1-0 because momentum is only gained by winning." "This was set up for an upset," McCarthy continued. "Playing on plastic, blowing a gale, against a team who have been playing well together and have some decent players. "I said to the players before the game, you turn up, you win, you get three points, and then you can whinge all you want about this stuff after. "But I am not inclined to [whinge], because we will play better. We will play better and lose, probably." Hendrick's winner was only his second international goal and McCarthy said he had been pushing the Burnley midfielder to be more of a threat in the final third. "I had mentioned in the press conference that he had scored one in 50-odd games, and I asked him the other day," McCarthy said. "He's a big, powerful midfield player and he has a bit of quality about him. He should get in the box, he should be a real threat. "The work that we did in the week; trying to get midfield players into the box and score, so I am pleased with that bit."